Higher, further, faster, more! That's the daring new attitude of Earth's Mightiest Hero, Captain Marvel! As Carol Danvers comes to a crossroads in her life, she makes a dramatic decision that will alter the course of everything. But when she heads into space, Carol lands in the middle of a galactic uprising! And taking her cat with her seemed like a good idea at the time, but there's more to Chewie than meets the eye -- unless you're Rocket Raccoon, Carol's new ally in the Guardians of the Galaxy! Plus: When a bad guy she has history with tries to blackmail her -- and turn the Avengers against her -- it's payback time! 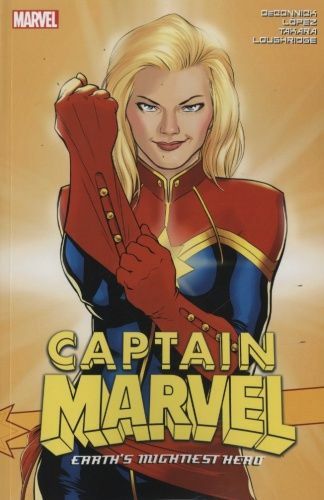 Captain Marvel's mighty adventures continue as she shows how to win friends and influence people of all species! Diesen Artikel haben wir am 15.02.2017 in unseren Katalog aufgenommen.